If you are a school or an academy looking to redesign your website, or a Multi Academy Trust looking to design your individual academy sites within a corporate style using a universal system? Or if you are looking to promote your school, either in the private or public sector? Then please read on. Undoubtedly successful website development within education requires both the design skills in consideration of navigation, layout, typography, photography and all things relating to visual aesthetics. Running parallel to the creative aspects is the need for a high level of technological expertise. But with a host of agencies, with varying levels of competence in either of these two disciplines, offering so many different packages and price options, the procurement process for website development can be quite daunting. So one of the principle objective’s of this article is to bring some constructive scrutiny and advise from a client’s perspective, who finds themselves charged with the task of commissioning web development services within the education sector. This is somewhat of an exhaustive subject so I have segregated the pertinent factors, into sections under clear headings, for what I hope becomes easily ‘digestible’ information. The above being more broadly discussed within, what may be considered to be, the inseparable strands of ‘creativity’ and ‘technology’. Generally speaking websites built from templates are where you place your content inside pre-designed formats, whereas bespoke websites are tailored to individual needs taking into account clients preferences in style and functionality. Many agencies offer website build using a template that they have used over and over again with the same template. There are several problems with this as outlined below, but in any case you are going to end up with a site that looks like so many others. At Wilson Design Group we are not a a great fan of creating templates to resell to clients and we only provide bespoke solutions. This kind of “off the shelf’” purchase is too restrictive and very often not very updatable to accommodate potential future needs. 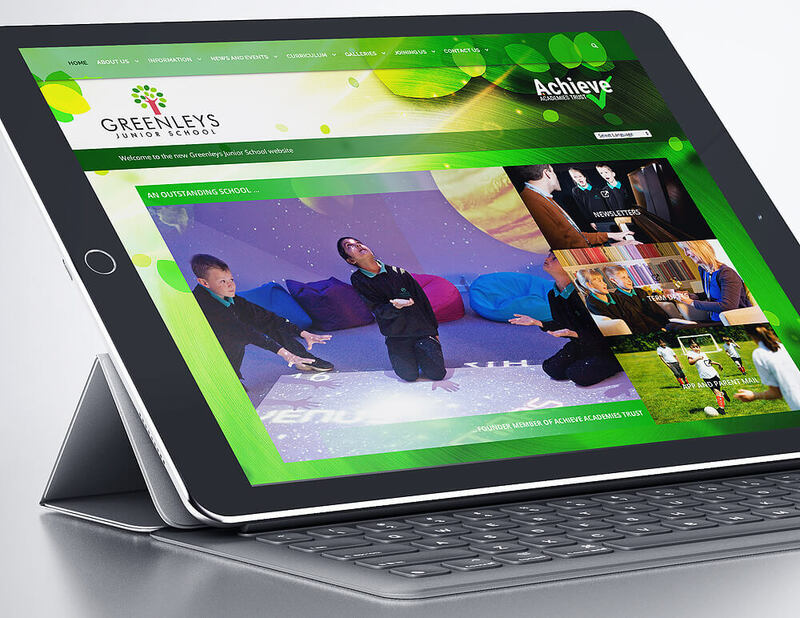 For example I can’t recall a single instance with any websites that we have developed for any school, where it wasn’t essential to have the flexibility of layout and functionality that can only come about through bespoke design and build. It seems to me that this is a little like offering one size of clothing to suit everyone. We prefer to tailor the design and build according to the content, style and functionality required, where the the only restrictions are the extent of one’s imagination, creativity and technical skills. Also you definitely can’t make the presumption that you are going to make any savings using templates as opposed to individualised, bespoke website solutions. I recommend whoever you are considering to build your school website take a look at their website portfolio and if they all look a bit too similar in style and layout they are probably using templates. Would you really want your site to look like everybody else’s? Leading on from the above mentioned discussion about websites built from templates and their limitations, its worth mentioning that you never quite know what added functionality you may need in the future and if you bought into a system that can’t be updated to cater for potential future requirements there is a real limitation. To demonstrate this in a little more detail. So let’s say you have discussed with your website designer all the things you think you need your website to do. That’s fine, but my experience is that clients often realise they need some added functionality at a later date, that they hadn’t thought of initially. That’s why it’s important to have built a site on a robust and comprehensive platform in which additional functionality can seamlessly be integrated to accommodate new technologies and changing requirements. There’s absolutely nothing more frustrating than finding you have limited access to change parts of your website pages. Of course, you may also want to impose limited access upon certain users involved in updating your school or college website, such as restricting each teacher of your school to editing soley their own class page. But we believe you should have at least the option to designate appropriate levels of control for different staff or users. This type of ‘user flexibility’ is a ‘standard functionality level’ built into all of our websites. However I am surprised how many websites out there are still incredibly restrictive in their ability to manipulate layout and content. This is mainly due to inadequate control managent systems. The control management system (CMS) being the mechanism which enables users to login to their website and edit content, change graphic elements and delete or add pages and a host of other things, depending upon the sophistication of the CMS. So if you are commissioning ‘web development services’ then the subject of content management is incredibly important. Content Management Systems vary enormously in terms of the ease, complexity and extent to which you can edit content on your website. This depends much according to how robust and user-friendly the editor interface of a CMS may be. Take a quick glance at the system we have developed which enables you to easily identify the parts of the website which you may want to change. It shows a direct reflection of the ‘front end’ of a website to facilitate content edits and changes with ease. School website page showing a direct reflection of the screen in the Control Management System and how all the visual elements are easily identifiable and editable with click and drag-boxes. At Wilson Design Group we develop websites using a control system which is expansive, education-specific and incredibly user-friendly. It is tried and tested and scalable for potential future needs and compatible with all browsers. We are available to arrange a demonstration of the system to potential school clients via skype or through a face to face meeting. I personally would recommend that clients experience first-hand, how the content management system of any proposed website works. You probably need to ‘test-drive’ any CMS to experience its extensity and ease of use, through a proper demonstration. You can link to more information about our education-specific control management system on the following link. 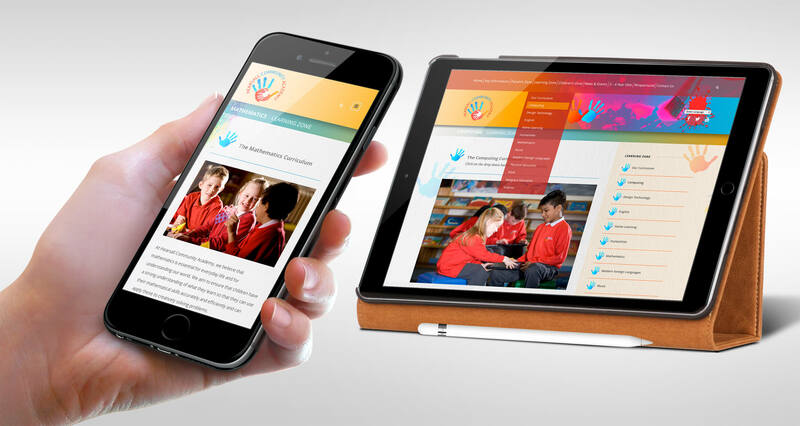 Ensuring your website works seamlessly on all devices: desktops, tablets and smartphones. Your site must take into consideration, that whilst perhaps someone such as the Ofsted Inspector may check out your website out on the office lap-top or desktop, “afore they come a knocking on your door”, the vast majority of pupil parents will be using some type of smartphone to visit your site. A quick google search will confirm this accelerating trend. The starting point then, is to ensure that your web content is as easily viewable on a Smartphone or iPad as on any other device. 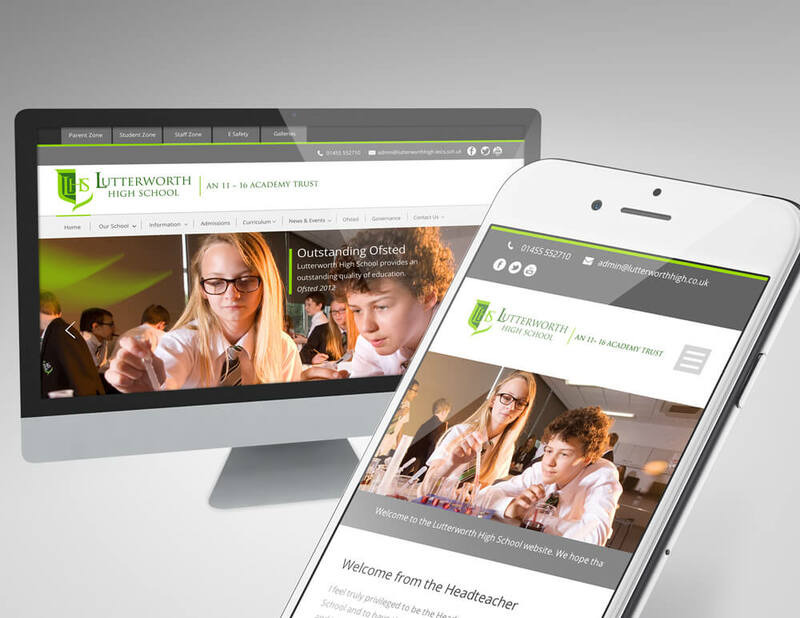 Your school website therefore absolutely needs to be truly responsive. I use the term ‘truly’ because many sites relying on the automated responsive capability of an inbuilt theme do not work particularly well and it usually take some coding expertise behind the scenes to make this function seamlessly. But what exactly does ‘responsive’ mean in this context? 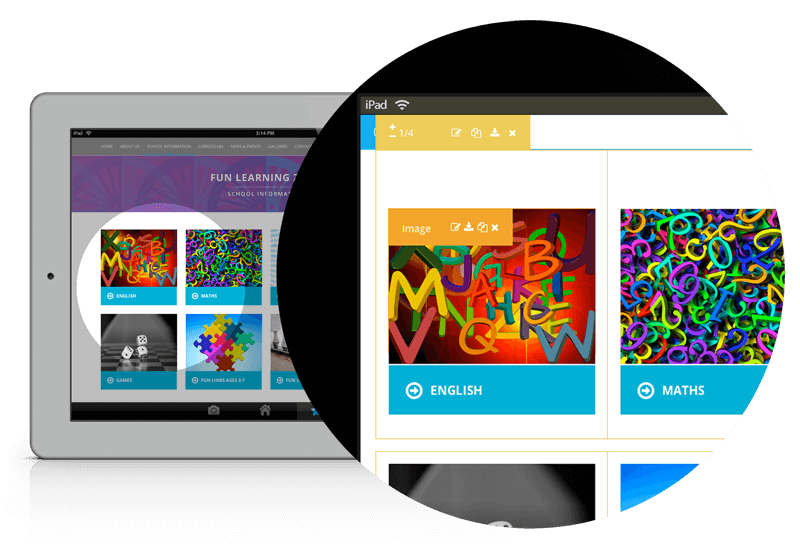 This term relates to the capability of automatic and intelligent reformatting of web content for all different devices, accommodating for resolution, image size and scripting abilities. Effectively there is a need to design at least 3 formats within one website. 1) for desktops and laptops, 2) for tablets such as iPads and 3) for Smartphones and other hand-held devices. Given a few more years they’ll doubtless be some other invention to cater for. When will the madness stop! Once again I reinforce the message to ensure you choose a website development company using a website platform that is updateable, scaleable and that will be able to adapt to new technologies; one which has the experience and far reaching skills to maintain your site for potential future, and not just present requirements. Any template “off the shelf” solution is unlikely to fulfil these criteria. The need to follow principles of Good School Website Design into terms of the afore mentioned responsive mode can be demonstrated through an example of one Headteacher I talked to when he said, to paraphrase: “We found we weren’t really reaching out to parents through our website so we got an app which seems to be more successful”. Okay so there is nothing wrong in using apps, perhaps as another means to deliver news direct to parents’ smartphones, but if a website is designed to function properly in the first place for hand held devices, there shouldn’t necessarily be a need ‘buy into’ external apps. One of the main problems I see all the time is that many educational websites are just not set up to easily view relevant information on smartphones and tablets and in particular the content for News and Events. For example, publishing school news items or school newsletters in a Word Document or a PDF on your website renders information practically impossible to view clearly on a smartphone. Considering such devices are the most popular means amongst parents, to connect to your website, in these circumstances, you are going to be limiting your ability to reach out to them. Please contact us at the end of this article if you need any clarification upon this important subject. If you find the subject of hosting packages for websites to be a little confusing, then you are not alone. Much has already been written about web hosting and further detailed information is easily accessible from many sources, so I will skip quickly through some personal recommendations. Essentially there are three main types of servers and multiple setups within each of these categories. The first is that of shared hosting which refers to a setup where multiple sites are all hosted together. Sharing resources as the name implies though can restrict performance. Secondly there is the option of hosting your website on a Virtual Private Server or VPS. With the VPS route you can allocate as much processing power, storage space and bandwidth as you like and this has many advantages, not least of all helping to avoid any downtime. If your site grows and you need more processing power you can allocate extra resources accordingly and this is a real hosting option for schools and colleges to consider. Thirdly the most superior type of hosting is that of dedicated hosting. Because of their high performance and resource allocation, dedicated servers are well known for their speed and uptime. In my personal experience, websites within the education sector are usually quite extensive with many pages and often require a fair amount of functionality. They are also likely to attract a large audience viewing the site, often at the same time known as high-traffic. My recommendation then, is that schools and colleges consider using at least a high specification VPS server and more preferably a dedicated hosting package. For universities and bigger educational institutions a dedicated server would seem to me to be essential for the highest level of performance and unrestricted access and control. It is a personal choice finding the balance between cost implications and performance requirements. At Wilson Design Group all our client’s websites are hosted on a dedicated server to give the highest level of performance and control. So clients choosing to procure the hosting as well as web development services from ourselves, which is almost always the case, do not have the worry of these considerations. If you require more information or advise please contact our Technical Team. You can also let us know if there are any other educational marketing services that you are considering commissioning. Also please do not hesitate to phone us for friendly advise about any of the issues raised in this article on 01522 510716 or use the following form to contact us. NEED MORE INFORMATION? PLEASE FILL IN THE FORM BELOW. If you are interested in our website development services or any of our other marketing services with the education sector please fill in the form opposite or phone direct.